I am so honored to be guest posting for Andrew today! I have proudly joined the Unprocessed Movement this year. Since my husband, two daughters and I were already on a healthy vegetarian diet, we just knew we had to take the Unprocessed challenge this month. We decided to adhere to the Unprocessed rules as strictly as possible for all of October. Starting in November, our family will remain on an unprocessed diet, making the occasional exception for a sweet treat now and then. I do have a sweets blog, after all! Although our family found the unprocessed diet fun and inspiring, our one main challenge came when it was time to entertain guests. We love entertaining, and we have dinner parties several times a month. I wondered how we would entertain and remain true to our new diet. Unprocessed entertaining? I admit I was stumped for a few minutes. I wanted to provide my guests with wholesome unprocessed food that tastes delicious. Possible? Oh, yes! 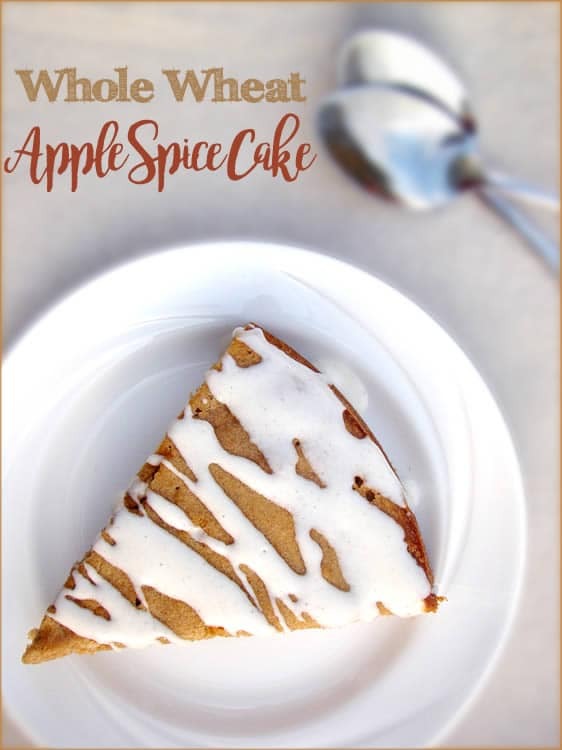 This Apple Spice Cake with Cinnamon Greek Yogurt Icing is absolutely delicious, and perfect for entertaining! The apple cake is made with whole wheat flour to give it a nice texture, honey to sweeten the cake, and coconut milk to moisten it. The icing is made with Greek yogurt, cream, and a touch of cinnamon — the icing is the perfect sweetener for the cake. Once you’ve tasted this cake, you’ll know that Unprocessed Entertaining is definitely possible! This Apple Spice Cake with Cinnamon Greek Yogurt Icing is absolutely delicious, and perfect for entertaining! The apple cake is made with whole wheat flour to give it a nice texture, honey to sweeten the cake, and coconut milk to moisten it. The icing is made with Greek yogurt, cream, and a touch of cinnamon — the icing is the perfect sweetener for the cake. Preheat the oven to 325 degrees Fahrenheit. Butter and flour two 9-inch round pans. Set aside. In a medium bowl, whisk together the flour, baking soda, cinnamon, and nutmeg. In the bowl of your mixer, beat together the butter and honey for 1-2 minutes. Add in the eggs, one at a time, beating well after each egg. On low speed, mix in the flour mixture until combined. Mix in the coconut milk, the applesauce and chopped apples. Pour the batter into the two pans. Bake at 325 degrees for 50-55 minutes, or until a cake-tester comes out clean. In the bowl of your mixer, combine all ingredients. Mix on medium-high speed for 4-5 minutes. Refrigerate for at least 1 hour before icing cake. Once cakes have cooled, drizzle icing on cake, and serve. Enjoy! For a fancier presentation, layer cakes with icing. That looks so, so good! Just made apple spice cake yesterday. It was very tasty, but that icing would’ve been wonderful. Thanks, Laura! The icing complements the cake really well. Try it next time you make your apple cake! Looks amazing! I’m always looking for lovely desserts like this one that have no processed sugar. I’m wildly impressed with the icing ingredients. Can’t wait to try:-) Thanks for sharing! I had to make a few changes, based on what I had on hand and it still is very delicious. I cut everything in half (except for eggs, I used only 2) and baked in a spring form pan. Substituted regular milk for the coconut milk, eliminated nutmeg and instead of a glaze consistency, just mixed enough cream with the yogurt to make a lovely garnish I could dollop. 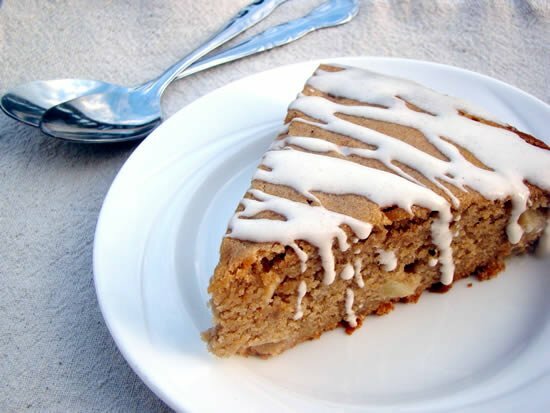 (flavored with the cinnamon and honey) This is a great cake and if you really want to be prudent, you could definitely cut back on the honey and have it for breakfast!